In the exploded view above, the top part is the very fine protective mesh between your ear and the drive and isn't really a part of the driver assembly itself but rather mounted on the baffle plate in front of the driver. Under it and again at the bottom are the two rigid polycarbonate halves of the casette that holds the diaphragm in position. The two thin parts just inside each cassette half are die-cut adhesive film that firmly attaches the diaphragm and stainless steel screen to the cassette and ensures mechanical separation of the cells. The green chevrons are small pieces of circuit board to provide termination for the drive and bias signals on the diaphragm and ground for the mesh screen. The three central parts are the HPEL driver itself. The upper part is a 0.1mm thick stainless steel mesh; the lower part is the 15μm thick metalized laminate diaphragm; the central part is a 0.7mm thick open cell Formex™ insulating spacer that has adhesives on each side. These central three parts are manufactured with a semi-automated, roll-fed process. Warwick expects this process to become fully automated as volumes increase. As you can see, this is a single-ended driver design; all electrostatic forces occur between the diaphragm film and the stainless steel mesh on its rear side (away from the ear)quite unusual for an electrostatic driver that usually has a stator both in front and behind the diaphragm. Sonoma claims the advantage here is that there is very little (just the acoustically transparent protective screen) between the diaphragm and your ears. The down-side of a single-ended drive system is that it's prone to higher levels of distortion, primarily 2nd and even order harmonic byproducts. The good news is that 2nd harmonic products are considered euphonic, which may make headphone a little tube-like in character. Thanks to a proprietary Finite-Element Analysis software package, WAT is able to fine tune the characteristics of the 'drum-skins' such that they have different resonant frequencies. Each cell is acoustically independent, but driven in parallel. As a result, the sound from each cell combines in acoustic space, but the independent resonances average out, avoiding any large resonant peak in the audio band (as can happen with a single driver area). Although the single-sided topology increases levels of even-order harmonic distortion, primarily second, this can be compensated for through the use of digital signal processing. Indeed, the combination of FEA (finite element analysis) with sophisticated DSP allowed WATL to counteract this particular aspect, and WATL feels the many positives of the HPEL design far out weigh this one negative (which is mitigated via DSP). No, there was not a conscious decision to go with a single-sided solution because of any desire for 'euphonic second-harmonic distortion'. The design goal throughout has been to minimize all forms of distortion to maximize the dynamic range and resolution of the transducer (and systems using HPELs like Sonoma's). Extensive analysis of the distortion performance of the HPEL has been undertaken using the COMSOL simulation tool. As a result, distortion has been reduced, and we have found a good correlation between simulation, measurement and listening tests. If you look at the level difference between the fundamental and 2nd harmonic (at 500Hz and 1kHz) you can see that each time the level increases by 5dB, the difference between the two peaks decreases by about 5dB. At 90dBspl, which is a solid level, the 2nd harmonic is 45dB below the fundamental tone; by the time you get to 105dBspl, quite quite loud, the two are 30dB apart. This seems to me like a very well controlled behaviour...we're seeing the DSP do its job. I'll note that at 90dB, nasty sounding 3rd order distortion products are -70dB down, which I calculate to be 0.05%. (Correct me if I'm wrong.) That's a dandy number. At 105dB these numbers increase to -52dB and 0.22%, not bad. You can also see that the fundamental and first three harmonics have good proportion with each one ever smaller than the lastthis is thought to be a positive indicator for sound quality. The thing you don't normally see is all those high order distortion products popping up between 2kHz and 10kHz. I reckon those are by-products of all the processing. 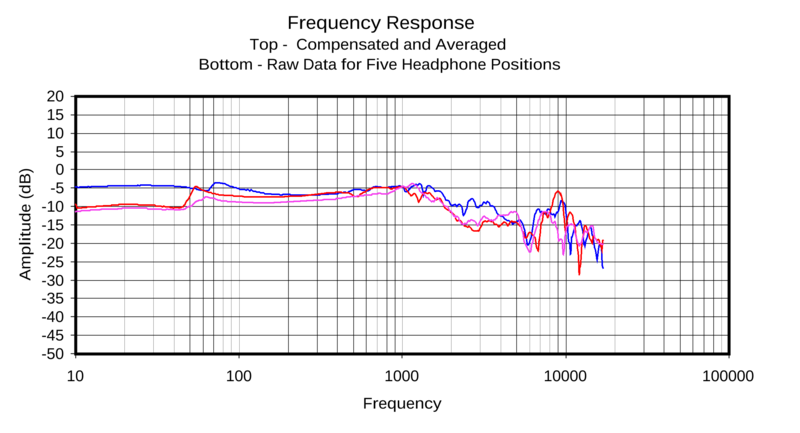 However, also note that these products remain under -70dB down until the very end at 110dB...where things go haywire. At 110dB the input voltage would be about 3Vrms, which is outside spec for the M1AMP; we're likely seeing the analog input section clipping somewhere...maybe at the ADC inputs. But, it could also be uncontrollable non-linearities in the driver. Now 110dB is pretty loud, so I think they've actually done a pretty good job of balancing things out until the system begins to reach its limits. But in listening using the digital inputwhich would bypass any chance of overdriving the ADC or DSP at fairly loud levelslouder than I would normally but not at what I would consider unsafe levels for a burst of fun, I could often hear sub-bass distortion, especially with EDM drops. 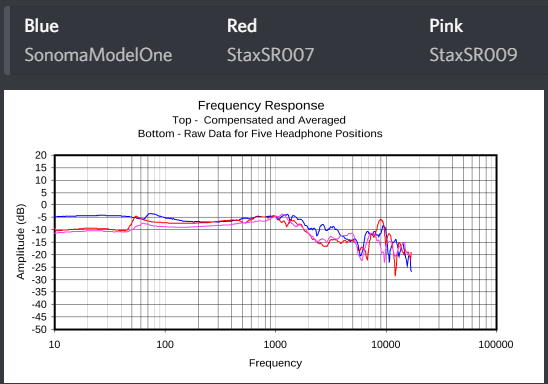 I took a look at low frequency distortion spectra. "...the system is dimensioned to meet, but not exceed, EN-50332 limits for maximum volume, etc." Check the volume control setting. It is possible to overdrive the electrostatic panels with excessively bass-heavy source material at high volume settings. When listening to these types of source material it may be necessary to reduce the volume setting slightly. I think the HPEL driver in the Model One has been brilliantly pushed to the very edge of its performance envelope. Bottom line: this is not a system for people who want a system that's capable of playing at elevated levels cleanly, or for EDM-like music or bassheads in generalyou especially will be running into these limits. The other thing the DSP is busily crunch numbers about is equalizing the headphones to match a 'modified, pseudo-diffuse field response'. Basically, these headphones are EQed to something akin to the Harman Target Response. 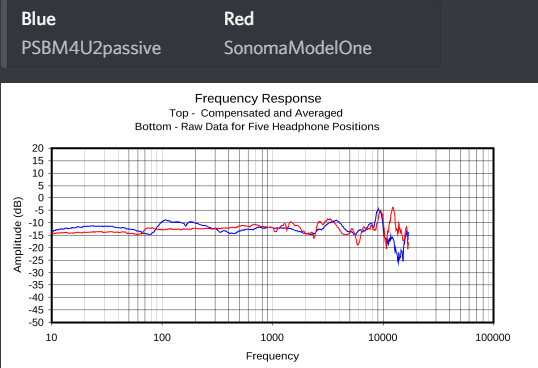 Here's the frequency response measurements. The raw plot gray lines are quite close to the Harman target; in the compensated plot above the raw responses, you can see the plot is nearly flat to 1.5kHz and then tilts downwards in a nice even fall. Other than being a bit rough, the response is free from large peaks or vallies until about 8kHz where it would be unheard of to not have a somewhat ragged plot. Again, this seems to be a very wisely tuned and well controlled headphone.